The Municipal House (Obecní dům) was built between 1906 and 1912 on the site of the royal court to provide new exhibition space as well as a modern auditorium. On 28 October 1918, the Czechoslovakian Republic was proclaimed here and meetings between the Civic Forum and the Communist regime were held here in November 1989. 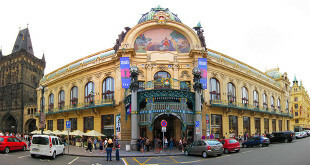 It is Prague’s most prominent art nouveau building, designed by Antonin Balšánek and Osvald Polívka. The Mayor’s Salon was decorated by A. Mucha. Spillar’s huge semicircular mosaic, Homage to Prague, on the façade above the main entrance, is its most striking feature. Inside, there is the Smetana Hall decorated by Karel Spillar and Ladislav Saloun – the biggest concert hall in Prague. There are also other smaller halls, conference rooms and offices, cafes and restaurants for relaxing and enjoying the interior decoration. Open: 10am-6pm daily. Admission: (only for exhibitions): 100 CZK. Tip: There’s no better way of rounding off a visit here than by enjoying a coffee in the grand Kavárna (café) Obecní dům.